I streamed through my college years in Pune, drawing energy for my multitude of activities from a power-packed Poha breakfast every day. For a South Indian used to Idlis and Uppma, Poha was the perfect transition agent. It was a little like Uppma in the combination of tempering ingredients that dressed it [the unmatched mustard, urad dal and green chilli formula], and felt far less alien than ghee laced parathas first thing in the morning. In the beginning, the ‘Aval’ as it is known in Tamil or ‘flattened rice’ [its anorexic sounding English equivalent], felt strange in my mouth. It was large and thick, and didn’t go down very smoothly. But gradually, I began to develop a fondness for this yellow delight. We took the Poha experiment to epicurean levels, and would compare the finer details of the Poha in the college canteen to the one in the tea-shop in our hostel neighbourhood. The best thing about the Poha was the speed with which it could be whipped up. Whether it was owing to a boiled vessel of flattened rice always being available on stand-by, or the talent of the Poha makers, it would take all of 5 minutes to have the plate slipped under your nose. After a night outside, it was the perfect 4 a.m. cure, to lift you out of your stupor and put you back on track. With every new culinary experiment, I unearthed a little more of the magic of Aval. It can blend seamlessly with a range of ingredients from carrots and beans, to potato and peas. Every time, it takes on each one of these new elements like a blank canvass absorbing paint. It can also be anything you want –a wholesome breakfast, a quick snack, or a flavorful dinner. It was but natural that the Aval experiment led me to my favourite ‘Vadais’. Having feasted on many varieties, I wondered how the Aval Vadai would fare in this universe. It didn’t let me down. Aval combines beautifully with besan and rice flour, and a host of spices to give you the succulent Vadai of perfect texture. The Aval can be easily pressed into the dough, and gives the exterior an interesting terrain which is both coarse and crisp. Our recipe uses ginger, onions and green chilies, but let your imagination loose as you think up interesting fillings. If the thought of a fried snack makes you guilty, remind yourself that Aval is a goldmine of iron and has low gluten content. For an even healthier option, you could even try the brown rice Aval! This piece was carried in The Hindu Melange dated Sep 13th 2014. Here s a link to that-. Click here. Wash the poha and rinse. Soak the flattened rice in about 1/2 cup of water for 10 minutes until it gets soft. Peel and chop the onion into small pieces and set aside. Now mash the soaked poha. Add all the remaining ingredients except oil. Mix very well to make a dough. Heat oil in a fan for deep frying. Divide the dough into small lemon sized balls and shape them into patties. 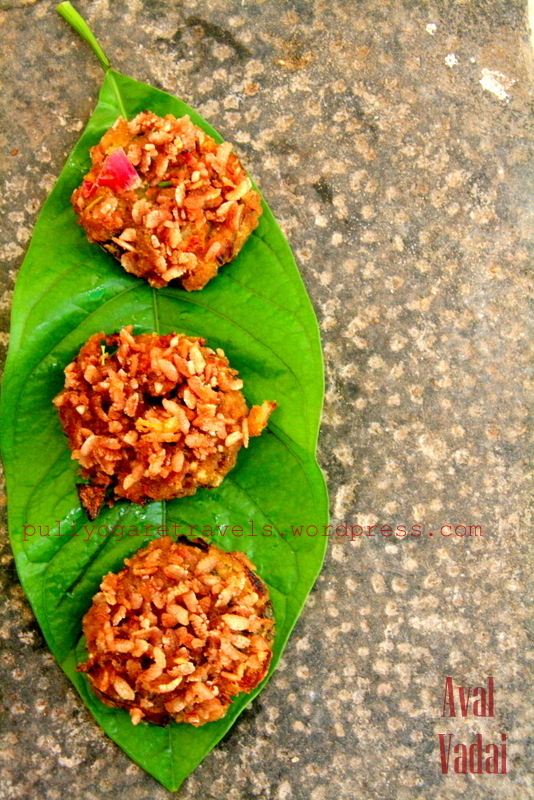 Coat the patties with some soaked poha on the top. Deep fry them in hot until golden brown color and crispy. Serve hot with coconut/ tomato chutney. For a healthier option, substitute white poha with red.